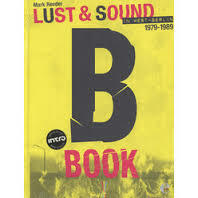 Just read a book (B-Book) and watched a film (B-Movie) about '80s alternative music in West Berlin, depicted/experienced by Manchester-born, Berlin-resident, Mark Reeder. Its ten years depict a (stereo)typically decadent city, from just after Bowie & Iggy left, to the advent of the Love Parade and the Wall coming down. Reeder somehow ended up as Factory Records' West Berlin rep, invited Joy Division over, formed a couple of bands of his own, managed the all-girl group Malaria for a while and generally got under the skin of the city - as well as making forays into East Berlin. Along the way he sketches Berlin's take on the Neue Deutsche Welle scene, including bands like Die Todliche Doris and Nina Hagen, and then the arrival of Blixa Bargeld, Nick Cave, Die Arzte and so on. I could share Reeder's excitement at arriving in West Berlin - that strange, isolated, exotic chunk of urban bohemia surrounded by communist East Germany. My first visit was in the first week of the new decade, probably a couple of years after Reeder arrived (the concert he organized for Joy Division was a fortnight after I left). I was 18, travelled there by train with a friend and stayed in a youth hostel. It was freezing, perpetually dark but it had an intangible energy, like it was living on borrowed time. I visited my heroes Edgar Froese, Conrad Schnitzler, Manuel Gottsching, Gunter Schickert and Michael Hoening. You could just do that then. Ring them up and go round to their apartment. Reeder talks about his early love of Krautrock from when he was working in a Manchester record shop, but once in Berlin he seemed to lose interest in it and gravitated to the newer scene. (There were connections: Gottsching produced Geile Tiere, Schulze put out Ideal's first albums, Kruger worked with Malaria etc). Anyway, both book and film are interesting. You can finish each in a couple of hours. The book's OK, a bit coffee table-ish. The film is better: it brings the place alive, you get to hear the music, marvel at Reeder's uniform fetish and meet some of the crazies, top of the list being Blixa Bargeld. It also includes Muriel Gray's visit when she did a West Berlin report for The Tube in early '84. But it's a little one-dimensional, a bit too 'isn't-Berlin-ever-so-decadent'. I went three times in the 80s and saw a different though equally alternative and interesting side.